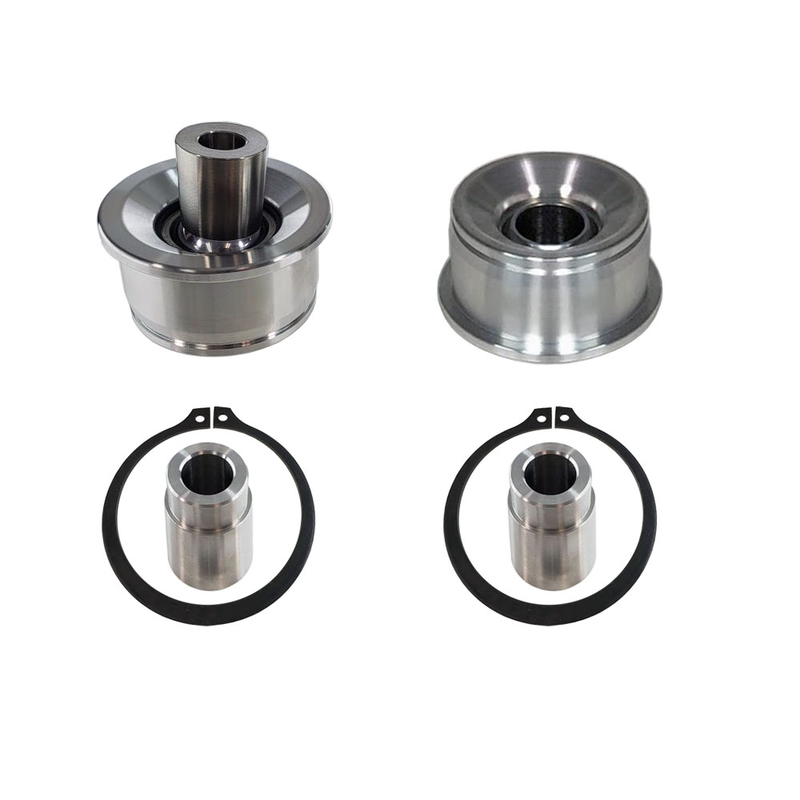 Reduce deflection in your front suspension of your 15-19 Mustang with our Front Lower Control Arm Spherical Bearings. The OEM rubber bushings in the lower control arm are known to cause changes in caster on turns due to the rubber bushing binding up. When heavy breaking while turning it can cause toe changes which make the steering unpredictable. By replacing these rubber bushings with a spherical bearing it allows free movement, reduces binding and makes the steering more predictable. Machined with a flange on one side for a positive stop when pressing in the bearing housing and snap ring on the other side to prevent it from ever moving. Made from 7075 Billet Aluminum instead of the standard 6061 that most of our competitors use adds strength to a critical part of the suspension. 7075 has a tensile strength of 83k psi compared to 45k psi or 51% stronger than 6061. Weighing in at 2lbs 11oz for the pair making them 1lb 6oz lighter than a comparable steel bushing. 2015 2016 2017 2018 2019 GT Ecoboost 2.3 V6 GT350 S550 Coyote 5.0. No one else can stack up to the bold clean styling of our aftermarket Billet dress ups, Street Strip & Racing Suspension & Performance Parts for your late model American Muscle Car!